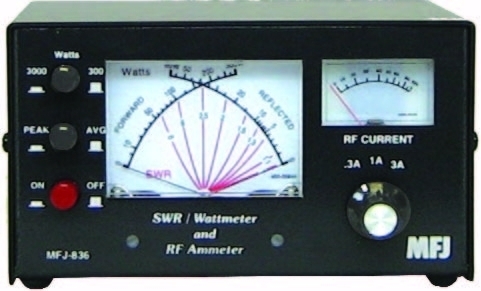 The MFJ-836H is an all-in-one RF Ammeter/SWR/Wattmeter! You can quickly determine feedpoint impedance and monitor antenna system for detrimental changes under power. Read RF current in three calibrated ranges -- 3, 10, 30 Amperes. A large 3-inch lighted easy-to-read Cross-Needle meter lets you read SWR, forward (300/3000W) and reflected power (60/600W) simultaneously.